"The helmet with a heart beat" - Introducing the Lazersport Genesis LifeBeam helmet with integrated HR. Lazersport is a Belgian company with one of the longest histories in producing helmets. They strive to continually deliver a perfect mix between design, comfort, safety and technology. (http://www.lazersport.com/). Much like the introduction of rear parking cameras, sometimes a product steps up and leaves us pondering 'why didn't I think of that?'. This helmet by Lazersport is a much needed step in the right direction for diversifying the delivery of heart rate and development of cycling accessories. If you're anything like me and dislike wearing a chest strap for heart rate (so rarely use it), the Genesis LifeBeam helmet makes that a thing of the past. With all the positive aspects of tried and tested Lazer technology (modelled on the Lazer Genesis race helmet), the Genesis LifeBeam is comfortable and well designed, and even with the HR technology it is a pretty light helmet at 280g. The helmet meets all the required Australian safety standards and is well ventilated for comfort on hot days and longer rides as well. The fit of the helmet is very secure, some riders may be preoccupied with weight or colour of a helmet, but I am more inclined to want something that won't be uncomfortable for a 4 hour ride, this fits the bill. The Rollsys retention system allows for accurate and symmetrical adjustment of the helmet around your head with an easy to use thumb roller on the top of the helmet. The HR is monitored by an optical forehead sensor that recesses into the forehead padding when pressed against your head. The sensor is small and barely noticeable when riding. The sensor runs HR information via a small wire through the top of the helmet (the wire sits under the padding) and is delivered to the HR unit 'the brain' at the back of the helmet. This is also where usb charging and power on/off occurs and it looks very cool with its blue low light. ANT+ and Bluetooth technology allows for the information to be sent to your bikes' head unit for easy monitoring during riding. The battery life is good and just another thing to add to your pre-ride charge list, I only charged the helmet once a week so it would depend on how much you ride. The helmet does state some limitations with usable temperatures and HR ranges, but only in exceptional conditions which most riders will not encounter. The only caution I'd note with the Genesis LifeBeam helmet is that the forehead padding (for the recessed optical HR sensor) reduces the inner length of the helmet by about 1cm, so if you are borderline on sizes, trying on the helmet or taking accurate measurement is advised for best fit. I initially used the helmet on some steady riding with some pretty good undulations to get an idea of whether the Helmets' HR information was reading in the zones and ranges I expected over different elevations (example below). In the initial testing I saw similar HR tracking to what I expected and had experienced before with a standard chest strap. To do a rough check for accuracy I did some additional rides with the standard HR chest strap and a separate device to see if there were any irregularities and was impressed with how closely the numbers overlapped. This not being my primary reason for testing, check out DC Rainmakers review for detailed HR accuracy review. If you're in the market for a helmet and HR monitoring is an essential part of your cycling training, this innovation meets both needs. With comfort and consistent HR readings, I found it quicker, more reliable and easier to use than a chest strap and something I can see catching on across helmet brands. 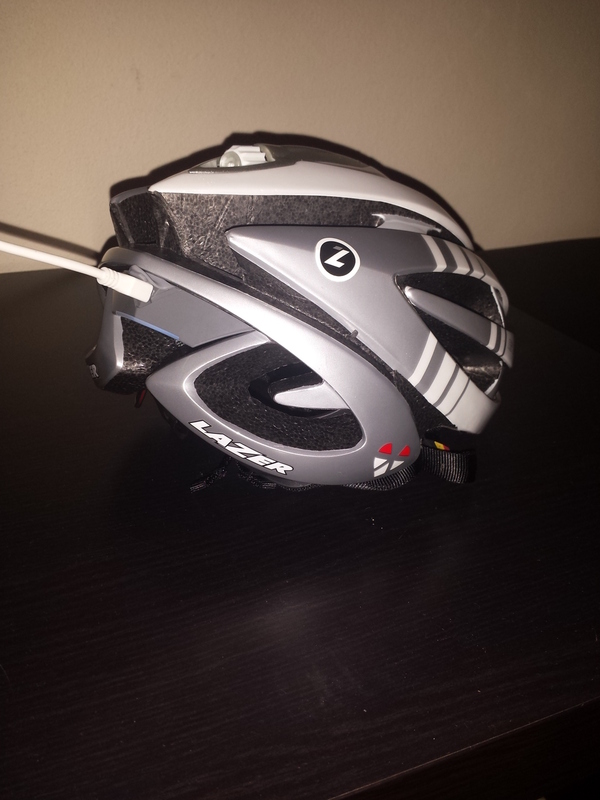 The bottom-line is the Lazersport Gensis LifeBeam helmet does what it states and does it well, at a price not dissimilar from other helmets in the market, I think you'll be pretty pleased with your spend if you choose to go this way.